Today illuminates tomorrow with its light. Always exterminating those who tarried." Commemorative plaque in the village of Portici, remembering the eruption of Vesuvius in 1631. 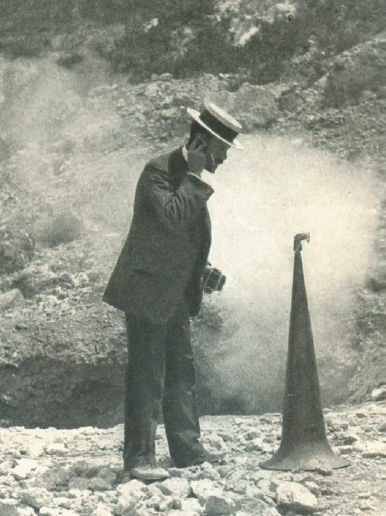 As so eloquent explained by many commenter's, the photo shows the volcanologist Frank Alvord Perret listening with the help of a selfmade geophone to the whispers of volcanic activity in the Campi Flegrei. Fig.1. F. A. Perret with an improvised "geophone," listening to subterranean noises at the Campi Flegrei, Italy, probably in 1906-1907 (the photo was published in 1907). As an able technician, Perret probably used a microphone to amplify the rumours from inside the earth; a cable can be seen in front of his face connecting the geophone to a loudspeaker positioned on his ear, in the other hand he holds a battery or control device. Photo from "The Day’s Work of a Volcanologist." The World’s Work, V. 25, November, 1907. 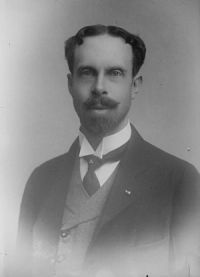 Frank Alvord Perret (1867-1943) was an American inventor and volcanologist, he studied particularly the volcanoes of the Canary Islands, Japan, Hawaii, Martinique -the infamous Pelee nearly killed him - and Italy, especially the area of Naples became his favourite field of research. He studied physics at the Brooklyn Polytechnic Institute, but didn't graduate and became self-educated as an electrical engineer. As a gifted inventor and technician for a period he worked in the laboratories of Thomas Alva Edison, developing new motors, dynamos and batteries. In 1886 he became independent with his own "Elektron Manufacturing Company", witch in the followings years experienced a notable success. His health began to fail in 1902, however, and while on a recuperation visit to the Caribbean, he stopped by Martinique to visit the ruins of St Pierre, the desolation of destruction experienced here impressed him profoundly. In 1904 during a visit in Italy Perret meet Raffaele V. Matteucci, director of the volcanological station of Mount Vesuvius, who got him interested even more in the young field of volcanology. Do ongoing problems in his health in 1906 he abandoned definitively his business to dedicate himself to a less strenuous and dangerous engagement: studying active volcanoes! "scientific contributions of Mr. Perret are unique in that no other volcanologist had the time and opportunity to make so thorough and varied observations on so many types of active volcanoes. He was a daring and sagacious researcher, indefatigable in his quest for information. He was a proficient and discerning photographer, and his publications are freely illustrated with fine pictorial records." During the eruption of 1906, the strongest since 1631, Perret and Matteucci used the Osservatorio Vesuviano - an observation building constructed in 1841 on the north-eastern slope of Vesuvius, as base. The volcano spit out rocks and lapilli, and strong earthquakes occurred. "In the building it was difficult to cross the rooms maintaining the balance if not by holding a hand against the wall." "The effect was the same. Like the mantle of a steel boiler, the entire mountain was pulsating and vibrating continuously." One day Perret awoke in the bed of the observatory by a strange rumour, a buzzing heard in the ear in contact to the pillow. Rising his head the rumour disappeared, Perret rose from the bed and put the iron bars of the bedstead between his teeth - now he could feel a constant tremble emanating from the underground. 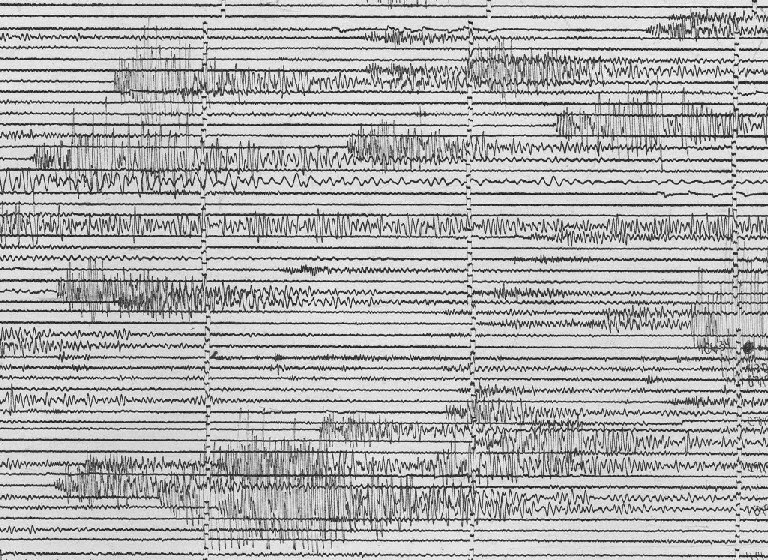 Perret had discovered the Harmonic tremors, constant vibrations often preceding a volcanic eruption, generated probably by uprising magma inside the volcano. Some days later Vesuvius entered in the most active phase of the eruption. Fig.2. 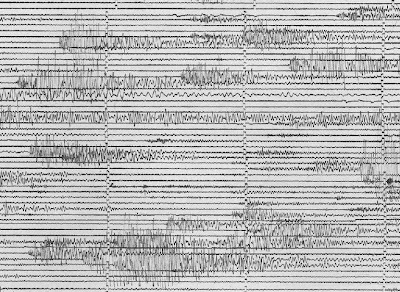 Example of seismograph recording of harmonic tremor by the USGS, image from Wikipedia. In 1911 he was one of the initiators of the first permanent monitoring stations installed on the crater of the Halemaumau on Kilauea, and in 1912 Perret begun with his research on the Hawaiian volcano, here he carried out the first direct measurements of the temperature of molten lava. When in 1929 the Pelee on the French Caribbean island of Martinique erupted, Perret was one of the first geologists to visit the volcano. In the three years of volcanic activity he conducted numerous observations and investigations, and in 1930 he built a small hut on the crest of Morne Lenard above the Rivière Blanche valley. Here one day he was surprised by two pyroclastic flows, rushing from the crater of Pelee, following the two valleys delimitating the crest. Luckily he survived unharmed; his only remorse was the inability to recover some gas probes from inside the flow. He studied the island and the mountain discontinuously for the next ten years, and could often be observed during field investigations, well-dressed with Van Dyke beard and straw hat. In 1932 he founded the volcanological museum in Saint-Pierre, which still today carries his name, to educate the native population but also to remember them of the dangers of an active volcano. In 1940 Perret returned to the United States, dedicating himself to the compilation of various books about volcanoes, he could publish them only in part until his dead, just three years later. PERRET, F. A. (1924) The Vesuvius Eruption of 1906. Washington, DC, Carnegie Instution. PERRET, F. A. (1935) The Eruption of Mt. Pelée, 1929-1932. Washington, DC, Carnegie Instution.